To Find Site:- Leave the A9 Autoroute at junction 26. Take D 979 signed for Aigues Mortes. As you approach Aigues Mortes look out for signs to Le Grau du Roi. As you get near to the town watch out and follow signs for Le Boucanet, this is the place rather than the campsite. Eventually the signs indicate Camping Le Boucanet. Entrance to the site is just off a roundabout, as you exit the roundabout (with a boat in the middle of it) turn right and campsite entrance is almost immediately on the left. The entrance is barrier controlled which is usually manned. 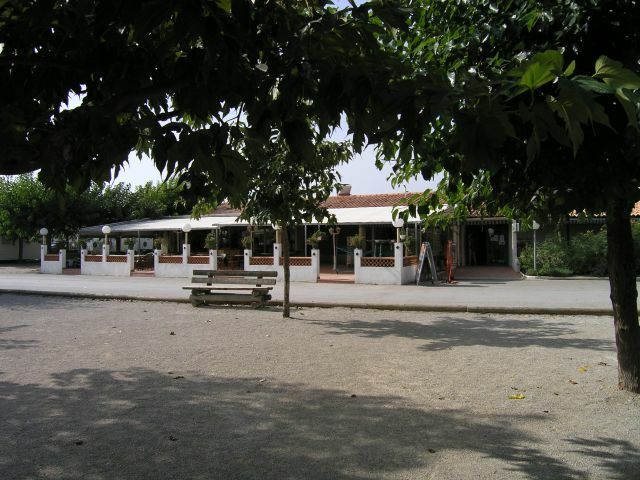 Le Boucanet is a large site with over 400 hundred pitches most with some shade and all are divided by bushes or flowering shrubs. 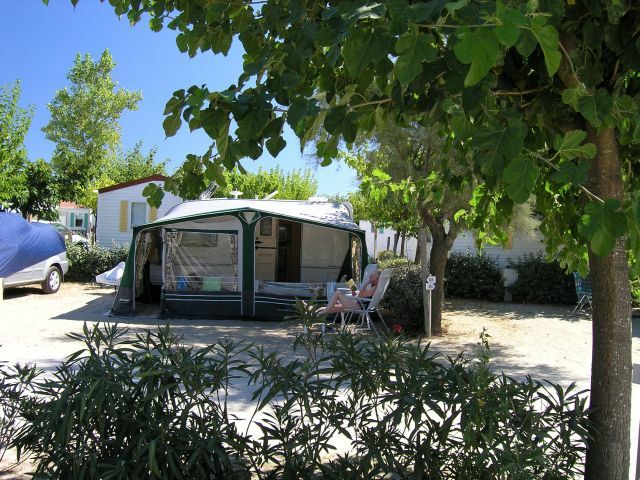 The majority are touring pitches but the site does have some mobile homes and tents for hire. 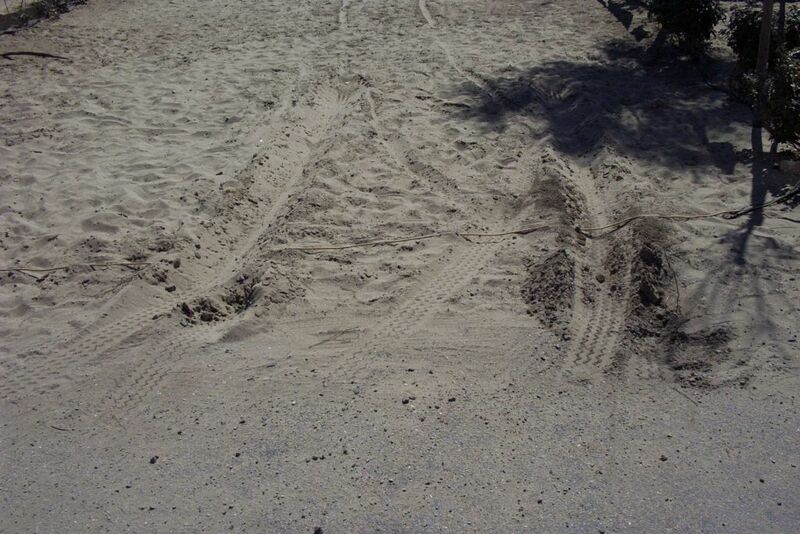 All but a couple of pitches are on sand and whilst most are reasonably firm there are those, particularly near the beach, which are very difficult to get on with a caravan without a 4X4 vehicle. This is a fact you will be unaware of if you book in advance, far better to turn up and choose your pitch although this is unlikely to be possible in peak season. The problem is caused by the location, long stay campers digging trenches to protect awning and tent campers doing the same. If you do have difficulty the site staff are very helpful in either dragging you off or placing your van in position. Size of pitches varies, most are OK and some are quite large. If you want to pitch next to the sea, these pitches cost an extra 5 Euros a day. The site has four toilet blocks, although at least one is closed at the end of August, admittedly it is the one surrounded by the mobile homes. All have showers and toilets and two have washing machines and chemical toilet empting facilities. My gripe with the toilets is that in all but one block the majority are of the Turkish, hole in the ground type. What of course happens is that everyone queues for the one English style loo, or uses the disable toilet. I don't understand the reasoning, surely a 50/50 would be more acceptable, particularly for a campsite that purports to be to an International standard. Boucanet has a bar/restaurant which provides entertainment on some nights which does go on beyond midnight and can be quite loud depending on where your pitch is. There is a takeaway selling pizzas and other dishes. Also in the complex is a fairly comprehensive shop, although it does run down a lot at the end of the season. They do manage to get English Newspapers early on the day of publication (except Sunday) which is quite impressive, There are the usual telephone boxes including one where you can connect to the internet, it is handy and costs about 11p a minute. 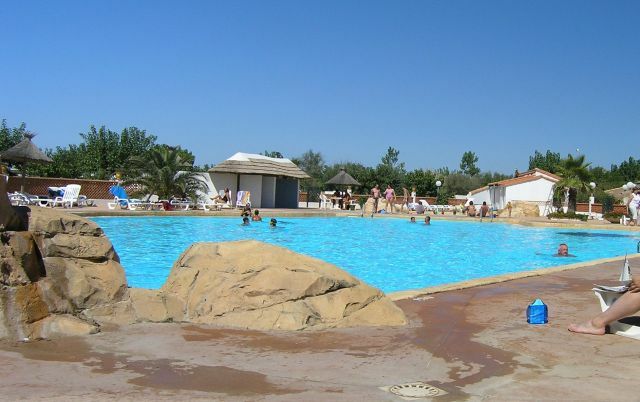 Perhaps unusually for a beach side site it also has rather a nice swimming pool. There are also tennis courts and table tennis tables. The beauty of this site is its excellent location right on a gently shelving beach so particularly safe for small children. Unlike campsites situated around St Tropez you have none of the difficulties with traffic congestion as there are good road connections. There are two excellent supermarkets about 7 miles from the site. 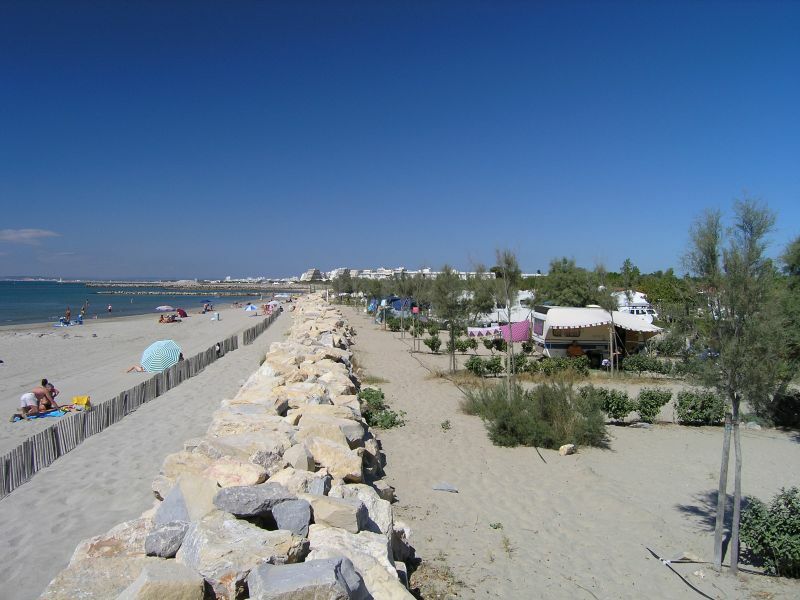 There are many interesting place to visit nearby, Le Grand Motte, Le Grau du Roi, Aigues Mortes, Stes Maries de la Mer and Nimes to name but a few. One major advantage of this site is that it accepts Camping Cheques out of the main season which gives an impressive saving. In many ways this site is best out of the main season as you avoid the crowds. However, just a little tip. If you intend to stay in September it might be best to arrive a day or two before they start to accept Camping Cheques. The site are happy to take part cash, part cheques. This way you get a better choice of pitch before the site fills with third age visitors!! !